Current: What is SWOT Analysis? 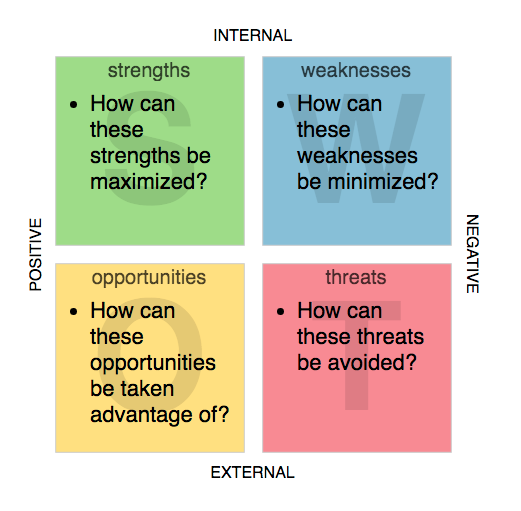 When to Use SWOT Analysis? How to Conduct SWOT Analysis? 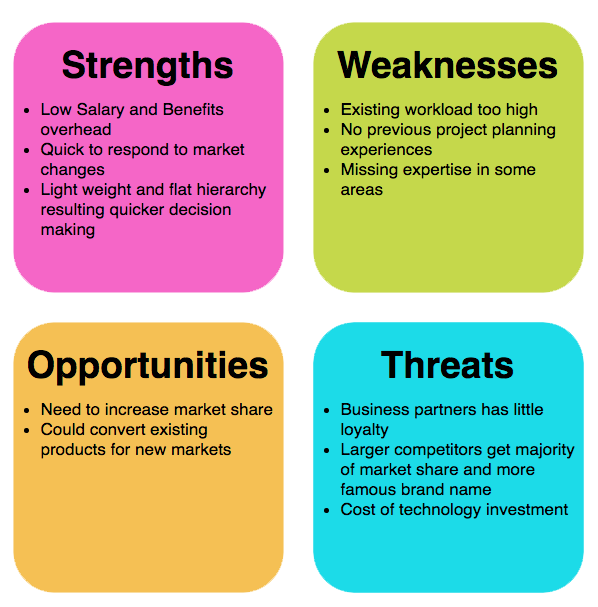 SWOT analysis is a technique developed at Stanford in the 1970s, frequently used in strategic planning. SWOT is an acronym for Strengths, Weaknesses, Opportunities, and Threats and is a structured planning method that evaluates those four elements of an organization, project or business venture. 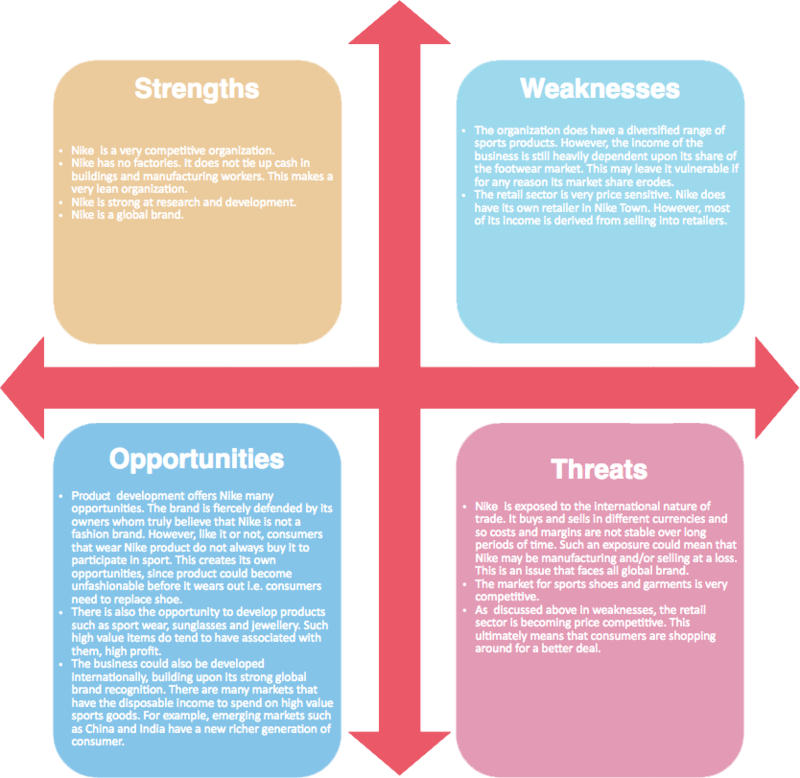 A SWOT analysis is a simple, but powerful, framework for leveraging the organization's strengths, improving weaknesses, minimizing threats, and taking the greatest possible advantage of opportunities. SWOT analysis is a process where the management team identifies the internal and external factors that will affect the company's future performance. It helps us to identify of what is happening internally and externally, so that you can plan and manage your business in the most effective and efficient manner. Organization can perform SWOT analysis for each of its products, services, and markets when deciding on the best way to achieve future growth. At the start of a project, it's important to get a handle on the current situation. Appreciating your strengths, studying opportunities, pinpointing weaknesses and identifying threats is a prudent way to kick off the start-ups in the right direction. Identify skills and capabilities that you have. What can you do particularly well, relative to rivals? What do analysts consider to be your strengths? Is your brand or reputation strong? What do rivals do better than you? What do you do poorly? What generates the most customer dissatisfaction and complaints? What generates the most employee dissatisfaction and complaints? What processes and activities can you improve? Where can you apply your strengths? How are your customers and their needs changing? How is technology changing your business? Are there new ways of producing your products? Are your rivals' customers dissatisfied? Are customers able to meet their needs with alternative products? Are customers needs changing away from your product? What are your competitors developing? Are your rivals improving their product offerings or prices? Is new technology making your product obsolete? Is your cash-flow and debt position healthy? Are sales growing slower than the industry average? You can develop a list of prioritized Strengths, Weaknesses, Opportunities and Threats based on some questions, analysis, interviews research of the current state and external operating environment. Step 1 - List all strengths that exist now. Then in turn, list all weaknesses that exist now. Step 2 - List all opportunities that exist in the future. Opportunities are potential future strengths. Then in turn, list all threats that exist in the future. Threats are potential future weaknesses. Step 3 - Plan of action - Review your SWOT matrix with a view to creating an action plan to address each of the four areas. Strengths need to be maintained, built upon or leveraged. Weaknesses need to be remedied or stopped. Opportunities need to be prioritized and optimized. Threats need to be countered or minimized. As you use the SWOT Analysis for planning, you align the positive elements to help take advantage of opportunities and identify the gaps in the negative elements that must be improved or managed. Driving to implications from the SWOT requires us to take a strategic leap, looking at the connections across the categories (e.g. where does a strength help us mitigate a threat), as well as looking holistically across for trends. 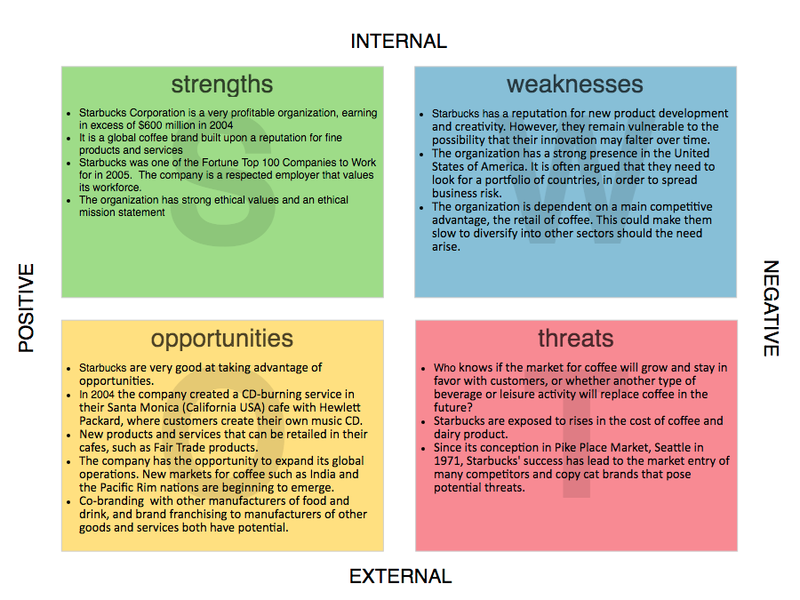 * SWOT Analysis is powered by Visual Paradigm's web technology. You can create it in both Visual Paradigm Desktop and Visual Paradigm Online.